Lock in a great price for Tasia Maris Sands (Adults Only) – rated 8.8 by recent guests! Next to the beach. Very clean. Good breakfast. Provides beach towels. The location is on. Although the beach is really packed. The location, the balcony on the penthouse pas breathtaking , staff are nice . I will definatly come again if I stop by Cyprus . The room was spacious, modern, comfortable and clean, with a great view of the beach. The staff was very polite and friendly. Also the breakfast was of good quality. Location is excellent Had to extend my stay, staff were helpful. Our room had amazing view, sunset was absolutely stunning in our room and it was also a sea view. Hotel was modern and location was quite good, by a small beach. Breakfast was good. Colin on reception was very friendly throughout our stay. Location was good despite the building works going on around the area. Adults only. Bonus! Would definitely stay here again. Spotless. Lovely room. Nice staff. Drinks not expensive for hotel. Next to a beach. Tasia Maris Sands (Adults Only) This rating is a reflection of how the property compares to the industry standard when it comes to price, facilities and services available. It's based on a self-evaluation by the property. Use this rating to help choose your stay! 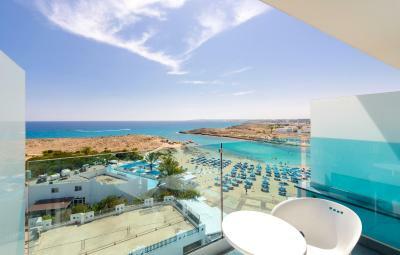 The beachfront Tasia Maris Sands Hotel is an adults-only property, located directly on the Ayia Napa beach. All rooms have a balcony and air conditioning. Facilities include two swimming pools and Wi-Fi. The Tasia Maris Sands Hotel features an outdoor hot tub and a floodlit tennis court. Guests can use the gym free of charge. When would you like to stay at Tasia Maris Sands (Adults Only)? Boasting sea from its balcony, this room is air conditioned. It includes a TV and bathroom with free toiletries. At the Tasia Maris we have one single goal in mind; making people smile in a friendly, healthy and safe environment. The Tasia Maris Sands Hotel is a modern hotel with a unique Small & Friendly character. It is situated right on the beach and is offering a great variety of facilities and amenities for both families and couples. House Rules Tasia Maris Sands (Adults Only) takes special requests – add in the next step! Tasia Maris Sands (Adults Only) accepts these cards and reserves the right to temporarily hold an amount prior to arrival. Please note that Tasia Maris Sands Hotel is an adult-only property, accessible to guests of 16 years old and above. We liked everything. Like one other reviewer wrote, the only bad thing was that the vacation was short and we left. Tasia Maris Sands is one of the BEST hotels in Ayia Napa and in general. It's 3* hotel but deserves more than 3 stars. Everything was above our expectations. The location is perfect. It is on a very calm and beautiful Vathia Gonia beach and very close to amazing Nissi beach, just 10-15 min. of pleasant walk. It's also close to Ayia Napa center, 15-20 min. walk. We booked double room with inland view which was considered to be w/o see view, but we definitely had some lovely view on the see and the beach. Check in and check out procedure was very fast, smooth and pleasant. The room was very comfortable, clean and well equipped. Free toiletries in the bathroom and complimentary tea, coffee, sugar and milk, Pool towels are also included in the offer (for free) which is also very useful thing as you can leave yours at home and it means much when you travel light. Before booking I read all reviews and was confused with some 'don't likes' like breakfast, noise, etc. The breakfast was very good, choice of food was very adequate and enough for the morning meal and it was tasty and fresh. We were never bordered by the noise and Wifi worked quite good in the room w/o additional fee. Though we never used pool as I'm never interested in pools when sea is within a hand's reach, the swimming pool facility was very clean. The water in the pool seemed little bit cold, but the entire place was good for lying on a sunbed and relax. And finally, the most important part, the Staff-PERFECT! Many thanks to Maria and Georgia from the reception, our lovely housekeeper Zoia and the Best Manager, whose name unfortunately I don't know. They all were very pleasant, smiling and extremely supportive! This is the longest review I've ever written. I stayed in 5* hotels as well, but Tasia Maris Sands is my favorite as it was more than a hotel, it was Home. There are pros and cons everywhere but our holidays were so nice we remember only good things. Bed was quite hard. Coffee / Tea stops at 10am so if your having a late breakfast stock up ! Very thin walls between rooms. We requested one big bed, but got a room with two small beds. The only thing... I didn't stay longer. Convenient location next to the beach. Rude reception staff. Argued with me about keeping my passport when they could have just copied it. Noisy at night. Parties until 5am. Music blasting through the walls. Clean and good location. Access to beach. Other guests putting towels on sun beds early in morning but not using them until the afternoon. Receptionist easily flustered by groups of people arriving. Very clean comfortable rooom. It was servied daily, nothing was too much trouble for staff. Gorgeous views from balcony, great location on the beach. A lovely place to stay. The shower was terrible. My whole room was flooded after a 15 minutes shower. They charged us to turn the fridge on our room on. Breakfast das terrible. The eggs where dry and everything else was quite full of cooking oil. Everything was perfect. We had a room with wonderful sea view. There was a free bottle of champagne and some fruits in our room, which was a nice surprise.